Aliz Koletas is the host and producer of Connecting Point, a TV show on WGBY in Springfield, Mass. Originally from Troy, she started her broadcast career in the Albany area but moved farther east this summer after the merger between WXXA and WTEN. She comes from a big fat Greek family which is at 18 …for now. Q We last talked to you in 2011. You were reporting for an independent TV show and opening a consignment shop in Troy. Catch us up to speed. A I opened my High Maintenance, Low Budget Consignment Shop in Lansingburgh and had such a blast getting involved in my neighborhood. Reporting and clothes are two of my passions so it was great doing both at the same time. Unfortunately, I had a pretty bad car accident in October 2011 and spent the next several months in the hospital, rehab and then physical therapy. I sadly had to sell my consignment shop and focus on getting better but it was such a great experience overall. Q When did you join Fox23/WXXA? A A couple months later, I decided to leave the show I was reporting for and join the local Fox station. They didn’t have any on-air positions so I worked off camera and bugged my boss until he let me go out in the field. I am very thankful for the many stories I got to cover but unfortunately, that didn’t last long. Fox23 and Channel 10 merged and I like to say, “They let all the awesome people go.” I wanted to balance my career with my personal life so I decided to look for an opportunity specifically in the Springfield, Mass. area. My car accident ironically helped me slow down and smell the roses. Q What do you do now? 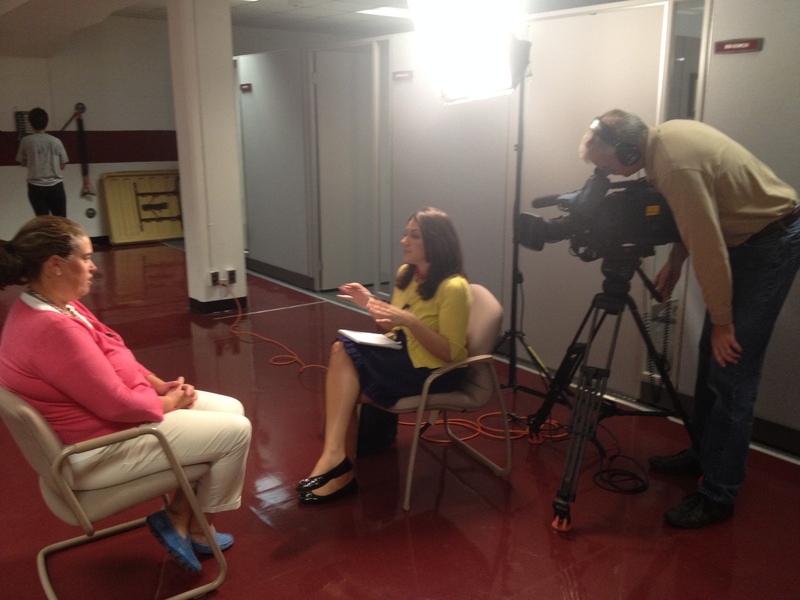 A Over the summer, I reported for ABC40 in Springfield. I was able to meet different people in the area and learn more about western Massachusetts. I am happy to announce though that I just accepted the position to become host for Connecting Point, a TV show that connects you with people, places and issues that matter most to Western New England. It airs on WGBY. Q What will your new job entail? A WGBY is a PBS station and they don’t have the same time constraints or limits like commercial TV does, so I get to dig deeper and discuss stories more in depth. I’m excited to explore issues and topics that are relevant and important to people in the western Massachusetts, northern Connecticut, southern Vermont and areas beyond. Q How does your culture play a role in your career? A Greeks love to talk and socialize! Even though I didn’t say a word until I was four, my dad loves to joke that I haven’t shut up since! I love to meet everyone and nobody is a stranger in my book! Also, in the WGBY interview process, I was asked if I could interview anyone, who would it be? I’ve never been asked that question before but in a second’s notice, the answer came to mind. I would interview my Yiayia (Greek for grandmother) who tragically passed away before I was born. She came over to the United States on a boat and faced innumerable odds with learning a new language, culture and way of life. That determination and fearlessness is something that inspires me and makes me part of who I am. I think she would also be proud of my baklava, too.